Ferdinand and Isabella. They are up there with the "big time" medieval monarchs--Henry VIII, Elizabeth I, and Ferdinand and Isabella. That being said, they are really known among most people for two things: the Spanish Inquisition and sponsoring Christopher Columbus. I will admit that my knowledge of Spanish history during this period lacks when compared to my knowledge of English, Italian or even German history of the same period. 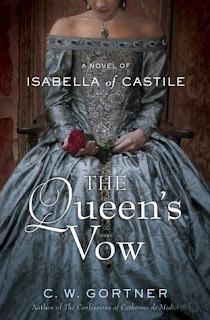 But, when it comes to biographical historical fiction, I prefer to read about characters I don't know as well, so the topic of Isabella of Castile appealed to me. This book sucked me in from the first sentence. Gortner does an admirable job of creating Isabella's world and drawing Isabella as a character who is both created by and rebelling against that world. Often times when I read about a "character ahead of her time," it just strikes me of an author taking a centuries-old figure and throwing a robe of 21st-century sensibilities over their shoulders. However, I really didn't get that from this book. I understood why Isabella was such a strong woman and, although she did not fit the mold of women in the late 15th century, she did not seem anachronistic. Gortner also needs to be commended on his descriptions of Ferdinand and Isabella's relationship. While he does take some liberties in order to tell this story--which he explains in his afterward--I think he probably has as accurate an account of their marriage as anyone 600 years later can write. Yes, they loved each other and, yes, Ferdinand had his dalliances. Marital fidelity among the ruling classes was, well, different during that time. If Gortner had painted Ferdinand as a pillar of honor on this count, he would have damaged his novel's credibility. I utterly enjoyed this book and it left me with 2 desires: to read more by C.W. Gortner and to go to Spain. I reserved Gortner's The Last Queen, about Ferdinand and Isabella's daughter Juana, at the library--but I think that visit to Spain will have to wait for a while. 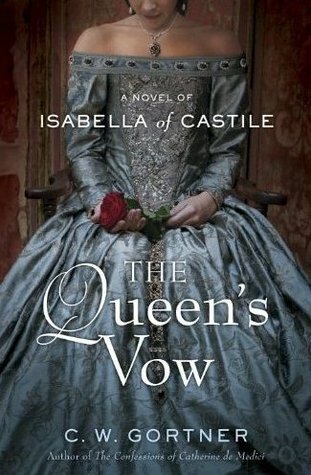 If you are at all interested in historical fiction, I heartily recommend The Queen's Vow. I was not solicited for this review and all opinions are mine and mine alone. I received no compensation for this review. That being said, I just discovered that this book is on tour with Historical Fiction Virtual Book Tours. If you are interested in reading additional reviews of this book, the schedule for that tour is listed here. I'm so glad that you liked this one :) I fell in LOVE with it and my gushing review will be going up soon, lol. I HAVE to get to the rest of his books!